A disturbing trend has spread across the country and has settled right here at the Jersey Shore. When I first heard about it the term “pay to play” was what was used but somebody got smarter along the way and it’s now commonly called “pay to participate.” Regardless of the terminology the meaning is quite clear….it you want to play school sports or participate in extracurricular activities than there’s a fee involved. Let’s be honest….every school district is dealing with financial and budget challenges like never before and sports is usually one of the first places to make cuts when they are necessary. That’s because many will stand on a soap box and tell you that school is about education and I’d be the first to agree. The difference between me and others is that I have always felt that sports have a role in education. I won’t say it’s on a par with learning to read and write but I also believe there are many who will never fully understand the value of being involved in sports and other extracurricular activities. We all agree that tough decisions need to be made in times like this and cuts are part of the process when it comes to education. However before parents, administrators and Board of Education members take an axe to athletics that should take a long hard look at what it is they are cutting. Dropping a freshman program means a certain number of boys and girls will simply go home after school instead of being on a practice field for a couple of hours. You’d like to believe that’s extra time for homework but we know better…it’s more time to play video games, watch TV or hang out in places that won’t do them any good. Wouldn’t it be better for them to be physically active, learning the value of teamwork and fair play and develop physically, mentally and emotionally? We talk so much about teen obesity but we are slashing programs which would better enable us to deal with that growing problem. As for the “pay to play or participate” experiment. Well I’ll admit it’s better than cutting something all together but it’s going to cause problems because parents will assume that if they pony up the money their son or daughter will play and not sit the bench. However the way things are going there may not be a bench to sit on….you’ll have to bring your own chairs. So this is a big week for new and old TV shows as the new season of prime-time TV gets underway. In some cases we’ve been exposed to glitzy promos for weeks and it’s hard to determine which ones are worthy of at least a first look. Thank goodness for DVR because for much of this week I’ll be taping two shows at the same time. My philosophy is to then decide after a week or two which shows become weekly rituals and which are history. I did enjoy the premiere of the HBO series “Boardwalk Empire” which stars the weird-looking Steve Buscemi as the kingpin of Atlantic City. The show is set in 1920 as prohibition becomes law and it’s a really well-down period piece that was actually filmed on a 300 yard boardwalk built in the old Brooklyn Naval Yards. The makers of “Boardwalk Empire” wanted to shoot the series in Asbury Park but it was not financially feasible which is unfortunate. However they did a really good job in making you feel like you might be in Atlantic City 90 years ago and I think the series will be a hit. It’s got a little “Sopranos” to it and is very much an adult program with a solid cast of characters. Buscemi, who often plays strange and quirky roles, is quite convincing as AC’s Treasurer which is pretty much just a front for his illegal operations. I also watched the first episode of “The Event” which was one of the most hyped shows coming into the fall and honestly when it was over I really didn’t have an opinion. I also didn’t have a good grip on what it’s all about but I’ll give it a couple of more looks. If that’s not enough I taped “Lone Star” and the new “Hawaii Five-O” which I’ll watch tonight while taping “Glee” and “Detroit 187.” Yeah I know….I lead a boring life. On an unrelated note….Atlantic Physical Therapy Center will host their 5th Annual Golf Tournament at Colts Neck County Club on Tuesday, October 5th. All proceeds from the outing will be donated to both the James Stevenson Warnock Scholarship Fund and the Monmouth County Child Advocacy Center. For information call the Freehold office of Atlantic Physical Therapy at (732) 431-2883. Rarely do I go to the beach after Labor Day because my schedule does not allow for it but yesterday after taking a bike ride on the boardwalk by wife and I did spend a few hours on the 2nd Avenue Beach in Seaside Park and what a bonus. It was simply a magnificent day, sunny and warm and while rough the ocean was perfect for a quick dip. It seemed like many locals decided at the last minute to hit the beach as by the time we left shortly after 1pm it was quite crowded for this time of year. Ron Emmert. Week #2 of the season saw a host of upsets, including Jackson Liberty’s 27-21 triumph over Wall Saturday night. Toms River Township Police Officers will team up with the Pizza Hut on Route 37 for their 20th Annual Vest-A-Cop fundraiser next Monday, September 27th from 4-9pm. The police officers will put on aprons and work as waiters and waitresses to raise money for their “bullet proof vest fund” with all tips and donations going towards the purchase of life-saving vests. There will be many activities for the entire family, including music; face painting, a bounce ride and the Ocean County Sheriff’s Department will produce children’s fingerprint ID cards. Also on hand will be MMA lightweight champion Frankie “The Answer” Edgar. What a difference a week makes. Giant fans are wondering about their team after getting crushed by the Colts last night while Jets fans can bang their chest with pride after a come-from-behind win over the Patriots in which Mark Sanchez outplayed Tom Brady. The storm that hit most if not all of Ocean County pretty hard last night wiped out what was supposed to be a big night of High School football in the shore area with games re-scheduled from today through Sunday. The Shore Sports Network was at Jackson Liberty getting ready to broadcast the Lions game with Wall but from the moment we arrived at the football field we knew this one was in jeopardy. Dark clouds on the horizon and lightning bolts made it an easy decision for school officials with the game called off around 5:45pm, more than an hour before kickoff. The teams will now play Saturday night but unfortunately we will not be able to broadcast the game. Thanks anyway to Liberty coach Tim Osborne and the Lions, who always go out of their way to make us feel welcome. Once that game was postponed I called to see the status of the Middletown North-Toms River North game and it was still on so I figured I’d drive to the home of the Mariners and at least watch a game. I was heading east on Cross Street when all of a sudden the wind started whipping and rain came down in buckets. I looked ahead and saw brake lights and realized a large tree had fallen across the roadway. Not knowing where to go I pulled over to the side of the road and within a couple of minutes a very large tanker truck came and basically just drove over the tree. That enabled cars heading in my direction to continue but within a half-mile there were other trees clogging up the road and I had to take a detour on James Street. Eventually I got to Route 9 and while on my way to Toms River found out the North game was on hold and like everything else it was later postponed. That game will now be played Sunday at 1pm as will the Colts Neck at Southern Regional game. The long delay is due to Yom Kippur which was the reason there were games scheduled on Thursday in the first place. As for other postponed games, both Brick Memorial at Jackson Memorial and Holmdel at Point Boro have bee re-scheduled for Saturday night. We will be broadcasting tonight’s Lacey at Brick game on 105.7FM. The Lakewood BlueClaws had game #3 of the South Atlantic League Championship series against Greenville rained out as well. The teams will play tonight at First Energy Park with game #4 Saturday at 4pm. A fifth and deciding game if necessary would be played later Saturday night in Lakewood. JFK Iselin while the Crimson Knights were shut down by Lacey. Tonight’s schedule is highlighted by the game between Brick Memorial and Jackson Memorial. The Lakewood BlueClaws host game #3 of the South Atlantic League Championship Series tonight at FirstEnergy Park against the Greenville Drive. The best-of-5 series is tied at a game apiece and both teams will be shorthanded as a result of Tuesday’s bench-clearing brawl in South Carolina. Each team had three players suspended for one game and that figures to hurt the visitors tonight when they will be without their leadoff and cleanup batters. Game time is at 7:05 and tickets can be purchased by calling the BlueClaws offices at (732) 901-7000 or at the box office. BlueClaws fans are assured of having another home game in the series Friday night. Congratulations to Brick Memorial head basketball coach and assistant football coach Ed Sarluca, Jr. and his wife Maureen on the birth of the couple’s third child. Michael Edward Sarluca arrived earlier this week and tipped the scales at 9 pounds, 5 ounces. He was welcomed home Tuesday night by big sisters Ela & Cara. Grandpa Ed, better known as Luch, is a football broadcaster for our Shore Sports Network and hopefully will be passing out cigars tonight. As the parent of a Penn State freshman and recent graduate there’s good news from the Wall Street Journal. A recent survey of recruiters revealed that Penn State is their #1 choice when it comes to hiring graduates for jobs. The recruiters for public and private companies were asked to select the schools “whose bachelor degree graduates were the best-trained, best-educated, and best able to be successful. Following Penn State was Texas A&M and other schools in the top ten included Purdue, Arizona State, the University of Michigan, University of Maryland and Carnegie Mellon. I think those three words make up the most often asked question there is and I don’t care where you live, how old you are or any other factor. It will be asked today in Toms River, Tuckerton, Trenton, Tallahassee, Tuscaloosa, Texas, Tokyo, Turkey & Thailand. Of course in some of those places they speak a different language so it won’t sound the same but regardless of translation we know the meaning of the question. Don’t ask me what made me think about this for a topic because the answer many people give is automatic….in other words they don’t really tell the truth. My guess is the response most heard after “How are you” is something like, “Fine or good, how about you? My take is that’s the answer you give when you really don’t want to give an answer so you throw it back to the person asking the question. In other words, like a true politician you basically ask a question to dodge one in the hopes that the original question is forgotten by the time somebody answers the question you gave them in response to their question. Yes I know this is confusing but not only is “how are you” asked repeatedly during the day but the responses usually come without any thought or reflection but rather are triggered by some kind of automatic thing in our brain. Let me try and clarify because I can see I’m getting nowhere fast. If I ask right now “how are you?” isn’t it likely you will give me a quick response that is really not an answer but actually just a conditioned….response. Here are the ones we would get most often (besides fine, how about you?). Great, things could not be better. I was honestly happy the Jets lost last night and I don’t like the Baltimore Ravens. But I’m an old-school guy and listening to Rex Ryan and watching “Hard Knocks” makes it easy to root against the green and white. They’re not in the category of the Cowboys or even the Eagles, but the Jets are pretty easy to dislike. At least for one week the Super Bowl talk will be on hold. Governor Chris Christie may be going too far in his pension reform plans but it’s hard to disagree that there is something wrong with a system that allows you retire with full benefits before you are 50 which is often the case with police and firemen. We all know their jobs may be dangerous but the truth working for 20 or 25 years should not entitle you to a lifetime of retirement funded by taxpayers. Season 7 of the HBO series “Entourage” may have started slow but I thought it ended with a bang and left us wondering about Vince’s career and Ari’s marriage. Unfortunately we’ll have to wait a long time to find out. I am really looking forward to the new series “Boardwalk Empire” which debuts this Sunday on HBO. Ocean County College President Dr. Jon Larson just might be the most eloquent speaker in Ocean County. Following him to the podium is really unfair…it would be like me modeling men’s underwear after Mark Wahlberg. The first weekend of the high school football season produced some real surprises and a couple of eye-opening performances. While Howell beating Toms River North was not necessarily an upset nobody could have predicted it would come so easily. The Rebels were virtually unstoppable in crushing the visiting Mariners 48-17 and it looks like Howell has found a capable replacement for graduated All-Shore quarterback Jimmy Ryan. Junior Ryan Davies, the son of head coach Cory Davies passed for 454 yards and 7 touchdowns in his first varsity start. passed for 410 yards and four touchdowns, three of them to Mike DeTroia. Another outstanding individual effort was turned in by Matt McLain of Pinelands, who ran for 325 yards and four touchdowns in a come-from-behind victory over Monsignor Donovan. The University of Maine’s win over Monmouth University Saturday made for an especially enjoyable afternoon for the families of two of the Black Bears players. Quarterback Warren Smith is a Lacey Township High School graduate while defensive tackle Ryan Nani played at Toms River North. Their families usually have to make long trips to support their football-playing sons so Saturday’s short jaunt to West Long Branch was a real bonus. Klee’s Bar & Grill in Seaside Heights is holding its 19th Annual Golf Outing for the benefit of Ocean of Love on Wednesday, October 6th at Gambler’s Ridge in Cream Ridge. The outing is always a great day of golf, food and fun and last year’s raised more than $28,000 for children with cancer in Ocean County. For information on playing or sponsoring you can call Glenn or Joe at Klee’s at (732) 830-1996. I will try and straddle the humble/egomaniac line in relaying what took place here on Thursday. For the past six months or so we have been renovating the inside of the building to create a more efficient operation where the studios are in one section and the business operation occupies another. Brenner Construction Enterprises coordinated and completed the project with a big assist from our Vice President of Engineering Jay Pierce. While the project was rolling along Millennium Radio President and CEO Bill Saurer talked to me about doing something to honor Bob Levy, who most know from his Sunday morning talk show “Topic A” which airs on this station and recently celebrated its 31st anniversary. Originally Bill was going to name the studio of our sister station WOBM AM 1160 for Bob, who co-hosts a daily morning show there with his wife Marianne. However he wanted to do something that would truly reflect the contributions of someone who began his tenure with the radio station before the roof went on the building in January of 1968. 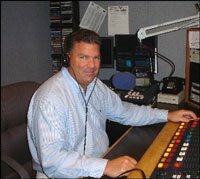 While Bob is best known for his on-air work many are not aware that he previously was the Sales Manager and General Manager and even the station’s very first sportscaster. So with me fully on board the project of naming our newly-renovated building on Route 9 in Berkeley Township was hatched. Only a couple of us knew about it so when Larry The Sign Guy came to install new signs yesterday morning they had to be covered. So too was one hung in our conference room naming that after Rosemary Lipari, who was hired in 1978 as a receptionist and when she retired in 2005 pretty much ran the place. was named in honor of my 31 years here which is a pretty neat and very touching acknowledgement. Afterwards we moved into the Rosemary Lipari Conference Room for a nice lunch provided by Wallach’s Farm Market in Toms River and a delicious cake from LaScala Italian Pastry Shop. All in all a good day at the Bob Levy Broadcast Center. as far as I’m concerned its football season and baseball can take a backseat. Of course being a Mets fan accounts for part of why my attention goes to the gridiron and not the diamond. On a couple of fronts the football season kicks off tonight. You have the NFL opener which is a rematch of January’s NFC title game as Drew Brees and the Saints host Brett Favre and the Vikings in New Orleans. As for the local teams….the Giants open the new Meadowlands Stadium Sunday against the Carolina Panthers while the Eagles visit the Packers in Green Bay. The much-hyped Jets have the Monday Night opener when they entertain the Baltimore Ravens in a match-up of two teams with Super Bowl aspirations. The High School football season officially opens tomorrow night but for us at the Shore Sports Network it actually begins tonight with the season debut of the Saint Barnabas Healthcare High School Football Show. Like every week we’ll be live at Boston’s in Toms River from 7-9pm with the show to air on 105.7 FM and 1310AM, two of our sister radio stations. Ed Sarluca, Matt Harmon and Asbury Park Press writer Steve Falk join me tonight as we preview the new season at the shore. Last season’s first weekend was interrupted by bad weather which forced quite a few cancellations. That does not figure to be the case this year and the opening weekend features quite a few games which could play a significant role in what happens this season. Friday night’s schedule includes Lacey at Wall, Brick at Brick Memorial, Southern at Red Bank Catholic and the game we’ll broadcast on the Shore Sports Network, Toms River East at Toms River South. Saturday offers matchups like Point Boro at Manasquan, Jackson Memorial at Manalapan, Toms River North at Howell and Lakewood at Holmdel with 83-year old Warren Wolf coming out of retirement to coach a Piners team that has lost 27 straight games going back to September of 2007. Oh and if all of that is not enough the second weekend of the college football season includes Penn State at Alabama, Notre Dame versus Michigan and Miami at Ohio State. Are you ready for some football? You better be. The 10th anniversary season of the Lakewood BlueClaws has been a very good one and tonight they begin the playoffs which the team hopes will produce a second straight South Atlantic League Championship. The BlueClaws are in Hickory, North Carolina to open a best-of-3 series with the Crawdads. The series moves to FirstEnergy Park Friday night and if necessary the teams will play a third and deciding game in the first round series on Saturday night. All games start at 7:05 and can be heard on WOBM AM 1160 & 1310, the flagship radio station of the Phillies’ Class-A team. Should Lakewood prevail in the first round they would meet either Greenville or Savannah in the championship series. The BlueClaws not only posted a franchise-record best 84-55 record but they led the South Atlantic League in attendance for the tenth consecutive season with nearly 432,000 fans coming through the turnstiles at FirstEnergy Park. Two members of the team’s front office staff have earned post-season awards from the league. Jim DeAngelis was named South Atlantic League Community Relations Director of the Year for the third time while Director of Inside Sales Lisa Carone was named the league’s Female Executive of the Year. DeAngelis is an original member of the BlueClaws front office staff while Carone joined the team in 2006. If you watched Penn State’s season-opening 44-14 win over Youngstown State Saturday you might have noticed that Glenn Carson made his Nittany Lions debut. The 2008 Southern Regional High School graduate played on special teams and also saw 4th quarter action at the fullback position. That was a surprise to me because as recently as last week Carson was listed as the 3rd team middle linebacker on the team’s depth chart. However reportedly he was shifted to fullback later in the week and #40 made a crushing block shortly after entering the game. Carson and the Nittany Lions travel to Tuscaloosa later this week for a nationally televised matchup Saturday night against Alabama, the nation’s top-ranked team. The high school football season opens this weekend with our Shore Sports Network broadcasting Friday’s Toms River East at Toms River South contest on 105.7FM. More on that later in the week. At 12:23 Monday afternoon I left the 2nd Avenue beach in Seaside Park knowing that it would probably be the final time I would feel sand between my toes on that beach until next year. As I approached the boardwalk I turned and look out onto a fairly crowded beach and paused because I realized that another summer had basically passed me by and we know all too well that you never know just how many more you’ll have. For me and many others the “beach season” ended on Labor Day and it was a fitting end to one of the best summers ever when it comes to weather. As a matter of fact yesterday earned a rare “10” from me as all the factors needed for perfection were present…..glorious sunshine, low humidity, breeze off the ocean, no flies, warm, clean water and low tide with a sand bar. It just does not get any better which made leaving all that more difficult. However as the saying goes “all good things must come to an end” and for me and many others Monday was it, even though the next few weeks just might be the very best of the summer. What I will miss most is getting to the beach early in the morning when the sand is virtually untouched after being raked. There is something about making the first footprints in the morning as I search for my spot as I’m always looking for a front row view of the Atlantic Ocean. No matter how much stress there is in your life, drinking coffee and looking at the ocean with the only sounds coming from the waves and seagulls is therapeutic. I’m going to miss that. I was first introduced to the 2nd Avenue Beach by my wife Jane in the summer of 1980 and we’ve been coming ever since. I’ve seen many of the same people summer after summer. I don’t know their names and rarely do we speak outside of exchanging a smile or nod of the head. I’ve watched families grow up on that beach just like my two children did. I’ve tried other streets which were less crowded but for some reason keep returning, even after they added parking pay stations right along the ocean this year which made things challenging. Having Surf Taco and the White Oak Market just down the street is convenient but the truth is the 2nd Avenue Beach is my summer home and I sure hope I’m able to come back next summer. How can it be Labor Day weekend already? It’s amazing just how fast the summer goes by and as I get older it seems like the summer weeks go quicker and quicker. Maybe that’s because I love summer here at the Jersey Shore so much….I guess if you live in a warm weather climate all year long it’s not special like the 14 weeks that make up the period between Memorial Day and Labor Day. While September just might be the nicest month of the year for most of us the rituals of summer at the shore will end this weekend. I’ve always been fascinated by how in a matter of 24 hours….the time between Monday of Labor Day weekend and the following day life can change so dramatically. Resort towns see the hustle and bustle end as beaches will be virtually empty, lifeguards are gone, businesses are shutting down and traffic is sparse. Even if the forecast is correct and it’s sunny and warm next week for many once that school bell rings the daily regiment changes so this weekend truly might be the last shot of summer. While business reports are mixed one thing we can’t complain about is the weather. Since the beginning of June we’ve had an incredible stretch of beach weather and for the most part the Ocean water has been warm, clean and calm. Of course the last couple of weeks have been a bit different with rip currents and this weekend we’ll have the effects of Hurricane Earl but that’s a small price to pay for what we’ve had most of the past three months. to cold, ice, snow and slush. That should bring a smile to your face. Physically I’m a mess. My back has been bothering me for weeks; I have pain in my left heel and worse than both is I hurt my left knee a couple of weeks ago. I don’t remember doing anything that caused a pop and pain but all of a sudden my knee started hurting. I thought maybe I twisted it but it’s now more than two weeks and its getting worse. I have an appointment to see an orthopedic doctor on September 13th…the same doctor who performed arthroscopic surgery on my right knee a couple of years ago to repair a torn meniscus. I have this feeling I’m headed for another one which is no big deal except football season is starting and I don’t have time. and is pretty self-sufficient, except my wife still buys most of his clothes. Plus throw in the fact that Labor Day weekend is here which means summer is all but over and you have a sleep-deprived, overweight, overworked, overstressed 54-year old searching for something. I think they call it a miracle. In some towns today there might be a noticeable difference in traffic patterns because for the first time in more than two months school busses will be on the road. Yes for some parents today begins the most wonderful time of the year because their children are headed off to school. The area’s largest district, Toms River Regional opens today, Jackson Township welcomes students tomorrow and most others in Ocean County will not begin until next Tuesday, the day after Labor Day. This also means that drivers need to be aware that children will be gathered at bus stops and more importantly walking and riding bicycles to and from school. Ultimately it’s the responsibility of drivers to watch out for the kids who often leave sidewalks and walking paths and wander out in the middle of the road. You need to be especially cautious in local neighborhoods when kids are headed off or coming home from school. If safety is not enough motivation to get you to drive carefully then be aware police will be seeking those drivers who don’t obey the speed limit and will be happy to issue them a summons. All drivers need to also pay attention before turning right on red because some traffic lights have signs that limit the hours you can make that right turn when school is in session. What will play out today in the Toms River District and in days to come in others is the Kodak moment known as the first day of school. There is really nothing like taking your son or daughter to school on their very first day of kindergarten. There will be tears and plenty of leg-holding for the children and stomach knots and yes tears for the parents. But you’ll all get through it and take it from someone who knows all too well that before you know it you’ll be crying at that same child’s high school graduation. There’s an old saying that you can’t judge a book by its cover which we most often use to say that what one looks like on the outside does not necessarily tell you what’s inside. I think most of us would agree that an attractive person could easily be nasty and obnoxious while someone not blessed with good lucks just might be the nicest person you will ever meet. However appearance also can tell you quite a bit about someone. While I acknowledge young people go through stages, you do see sights that leave you scratching you head wondering just what are they thinking. While it was a long time ago I have come across pictures of myself when I was in my late teens and sporting a natural Afro that was so high I probably could not wear a hat. I mean Link Hayes from the show “Mod Squad” had nothing on me. Of course I realize some of you are too young to remember that show. I say all this because the other day I came across a group of what I believe to be teen-agers probably in the 16 to 18 year old range. It’s kind of hard for me to be sure based on assorted hairstyles, colors, tattoos and metal that was everywhere. Earrings, nose rings, lip rings, tongue rings and goodness who knows what else. Being an adult I should have not jumped to any conclusions as they might be National Honor Society material who are caring members of the community. As I walked by they were skateboarding, smoking cigarettes and exchanging in small talk. Were they discussing the start of a new school year, Hurricane Earl, or baseball’s pennant races? I can’t tell you because every other word I heard started with the letter “F” and I couldn’t make out the rest of the dialogue. Surely with adults like me in the area they would curtail their obscenity-laced conversation. No, as a matter of fact they increased their volume as I walked by and seemed to smile and enjoy the fact that I and others in the area were repulsed by their language. I wanted to say something, wanted to tell them what no-good useless pieces of trash they were but paused and remembered that you can’t tell a book by its cover so I simply kept walking. Maybe it was the mature thing to do but now that I think about it I wish I would have grabbed a couple by their nose rings.